People hear it all the time, “Have a good day.” Usually it goes in one ear and out the other without connecting. And, meaning well, we automatically sign our personal letters or emails, “Love.” Nice to say. Nice to hear. But how often have you said to somebody: You Matter? Or how often has somebody said those words to you? It’s taken me 52 years to get it, but I finally accept that it’s true – I Matter. I didn’t realize this from posting countless selfies with just the right filter on Instagram, or from a record number of “likes” on Facebook. It didn’t even come from writing a book about love and wholeness. It came when I inspired over 14,000 people to tell half-a-million other people that they matter by giving out cards that said so. And it came when I traveled this You Matter journey right along with them. It started two years ago when a colleague gave me a business-sized card with only the words, You Matter. I’ll never forget the feeling of warmth that radiated through me when she looked at me as she placed the card in my hand. The feeling stayed with me long enough that I decided to order my own supply of You Matter cards and then started sharing them with family and friends. As I became bolder, I began giving the You Matter cards to people in my community who make my life richer –like my dry cleaner and the man who sells me fruit at the farmers’ market. Then, weeks later, a specific encounter at a grocery store touched me to my core. Then she gave the cashier food stamps. My heart ached. I wanted to help but didn’t know how. Should I offer to pay for her groceries, ask for her husband’s resume? I did nothing. And the woman left the store. As I walked into the parking lot, I spotted the woman returning her shopping cart, and I remembered something in my purse that might help her. My heart pounded as I approached the woman. And I handed her a You Matter card. After we embraced, I walked back to my car and cried. It’s hard to convey the mix and strength of feelings that brought me to tears. Even though I didn’t give the woman money or find her husband a job, through the card, I gave her something more important: validation. Her story mattered. Her suffering mattered. She mattered. And in affirming that she mattered I affirmed that I mattered. In that shared moment, there was no “other.” There was just an authentic, heart-to-heart connection between two people. Two weeks later, I was asked to choose a final project for a program I was taking in Applied Positive Psychology – the science of human flourishing. Still basking in the afterglow of sharing You Matter cards, I decided to turn my final project into an invitation for others to join me in spreading this vital message. In fact, Chris Peterson, one of the forefathers in the field of positive psychology said that the entire practice boils down to three words: “Other people matter.” My experience in the grocery store confirmed that telling other people they matter certainly matters – to them and to us. And thus the You Matter Marathon was born. 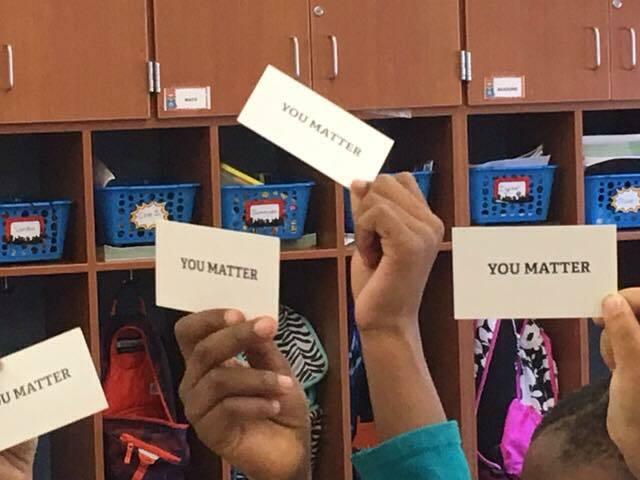 Its purpose was to create positive connections between individuals and within communities by sharing You Matter cards. Not knowing if other people would want to join me in this card-sharing opportunity, I set what is known in positive psychology as a BHAG – A Big Hairy Audacious Goal of collectively sharing 10,000 You Matter cards in November, 2016. I hoped I could find 333 people to willingly share one You Matter card a day during the month. Unsure what I was getting into but letting my passion guide me, I decided to mail 30 cards -- free -- to each person who signed on. That would make it easy for them to participate, and it would also give each person the experience of receiving a You Matter card before giving them out. Once the website was live, I started spreading the word and inviting people to sign-up. Some friends, and certainly the marketing people I consulted, suggested I add the You Matter Marathon website to the back of the card to get more people engaged, but I steadfastly refused. My gut told me that adding anything other than the words You Matter would turn the card into a promotional item – the very opposite of its intent. I’m glad I held firm. Almost every time I give out a You Matter card the person immediately turns the card over to see what the catch is. When they realize that there is no catch, they lower their hunched shoulders and breathe in the message: You Matter. Not because of what you do, who you know, how big your bank account or your to-do list is, but just because you exist. A simple message with a profound impact. Thankfully, with the reach of Facebook and help spreading the word from some wonderful online communities, it didn’t take long for people to start signing-up for the Marathon. And by the end of November we had far exceeded my BHAG of sharing 10,000 cards. Nearly half a million cards were handed out by over 14,000 people in all 50 states, 59 countries from Canada to Australia. And as impressive as those numbers are, no numbers can do justice to the true impact of even one card share. Clearly, the message had touched people. It also confirmed my suspicion: telling others they matter… matters. Not just for the one holding the card, but also for the one who has just given it away. When people looked someone else in the eyes and handed them this card, both the giver and receiver were transformed. Many fought back tears, many reacted in disbelief, all expressed profound gratitude. Even when people left cards in library books, ATM machines, and on car windshields they felt validated. When I say YOU matter, then I matter. But giving out cards was just the first step toward a transformational way of seeing the other. 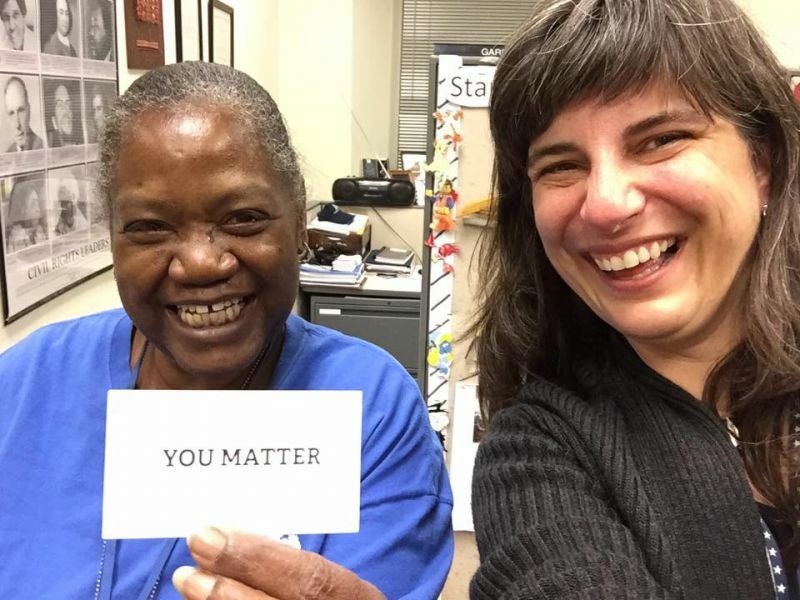 In many ways, the You Matter cards were like training wheels on a bike… eventually people didn’t need to rely on the cards to let people know they mattered. They could tell them through eye contact, they could use their own words of acknowledgment and gratitude. And each time they did, they reinforced their own significance in the world. Typically I carry tissues in my coat pocket – now I also carry You Matter cards. I leave them on car windshields in parking lots, include them with tips, and, of course, give them to people I meet. Sharing the cards has become a happy habit…one I will never break. As a friend of mine who also shares the cards regularly said, it’s like having a super power in her pocket. In fact, just last week, while waiting in the checkout line, I noticed the young woman at the register--she had short, spiky, lime-green hair, a nose ring and funky purple glasses. Her look was the opposite of my traditional suburban yoga-pant style. But what stood out most was her radiant smile and the deliberate way she looked at customers as she rang up their purchases. 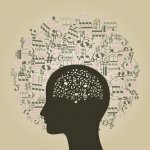 Social scientists have taught us we are social animals, hard wired to connect. Yet we are living in a time where many people feel increasingly disconnected. Researchers have determined that this disconnection, this loneliness, is toxic for our health. We must find ways to bridge our divides. Common courtesy is a start. Compassion is a start. The reaction of the young woman at the cash register so moved me, I returned to the store the next day to ask what she felt when she received the card. She said she had been having a really bad time and the card touched her deeply. She said her hands shook for an hour, and when she got home she “cried it out.” She asked if I had an extra card so she could offer it to a coworker who gave her food when she ran low at the end of the month. Once again, I was moved to tears. We’re living in a world filled with selfies, professional branding, Facebook likes. We believe that by seeking validation that we receive it. We receive validation when we validate others. Sounds a little over the top, but it isn’t. Almost every time I give someone a You Matter card I am creating a micro-utopia, a wonderful feeling they may never again receive, feel. And I feel it too. And dozens of people who participated in the marathon last year tell me, in different words, that they feel the same way. Yet another participant wrote: “I am finding it goes beyond the cards - which is no surprise. A customer service rep called to apologize for not returning my call sooner. They had no further information available for an issue I am having. I thanked the woman on the phone for the call, and said "You Matter" as part of my goodbye. It started a whole new conversation about leadership. We spoke for another 20 minutes. At the end of the call, she said "Mr. Brown, You Matter, you really do!" It was extraordinary. Reflecting on the call, it is so obvious how easy it is to build bridges." “The 94-year old Hospice patient I visited this afternoon was just waking up from a nap. 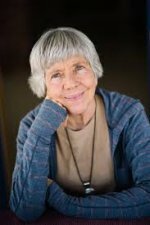 Because of her Alzheimer's, our conversations are typically a bit upside down and inside out. As I was leaving, I gave her a You Matter card. "Can you read that?" I asked. Her smile was so warm and genuine that I knew we had connected. "Today I realized that I teach 22 children who really matter. I put a card on each desk and was surprised at how much that meant to my seven year olds. They made me You Matter notes on little pieces of paper and left them for me all day long. Many of them taped the cards on their desks. I felt so good seeing how the You Matter message made my students feel. One little girl told me that it made her feel happy all over." It showed me the potential and power I have as a human being to make a difference, by interacting with people in a deeply personal way if only for a moment. That’s just for me: Cheryl Lee Rice. And then I look at the potential difference the You Matter Marathon is making for hundreds of thousands of others and my joy and pride runneth over. Learn more about the You Matter Marathon here! Cheryl Rice is a professional speaker and coach and the author of Where Have I Been All My Life?. Her company, Your Voice Your Vision partners with women striving to be leaders in their own lives. The heart that breaks open can contain the whole universe.